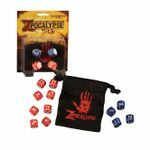 The set comes with 2 types of dice: Blue and Red. Red is used for attacking and blue is used for ammo checks. The red die has a Z in place of 6 bullet hole pips, to denote a possible zombie bite, while the blue die has a 'click' symbol in place of the one's spot to denote your weapon is out of ammo. Very useful for 4-person games, or for your own custom homebrew games.